The sandstone circle symbolises unity and infinity and also depicts the journey of life. A mural represents breaking the silence about the disease and bringing it into the open where there is hope. 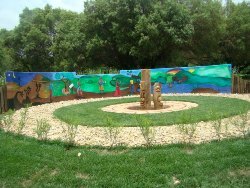 The creation of the Garden of Hope is a realisation of a long-held dream of the Free State National Botanical Garden. It was inspired by the courage of people faced with HIV and AIDS in their lives. The garden will serve as a living testimony of compassion, hope and love and it is dedicated to the memory of those who have lost their lives to this disease and those whose lives have been changed forever by it. Read more about the Official Opening of the Garden (beacon) of Hope.